+ Band is a group communicating app that allows you to stay in touch and organized with groups of people in your life. + You create groups with as few or as many people as you need. Make a large community for something you care about or a small group to plan for that holiday party. You add only the people you want. So you can make it a personal group or invite other strangers on band and get to know them! + Within each group you can instantly chat with everyone, set up lists and to-dos where you can keep track of what you need for a get-together or goals you want accomplished that everyone has access to, create polls and questions, calendars, file and picture sharing, really anything! + You can even access your “Bands” right on you computer too! The app is available in the App Store (Apple users) and Google Play (Andriods). Actually, it is the perfect app for college students, families, and coworkers! (Really anyone can find a use!) You can stay connected with the people YOU want and not get information lost in all the chaos of other social media like Facebook, Twitter, etc. The Band app is perfect for organizing study groups, clubs, sports teams, parties, coworker meet-ups and projects, family gatherings, even bloggers wanting to work on a project together! + Have you heard of or have used Band before? + What groups would you create using Band? Hey guys, long time no talk! Things are going so much better on the life front! Thank you all for you sweet comments on Friday. They all put a smile on my face and got me off to a great start to a new week 🙂 But I am sure you are all still dying to know what the big stupid thing I did last weekend to myself was. Wel,l it was Sunday evening and I was trying to work on a new recipe. Then things went bad in the household with the family and thus proceeded the yelling and anger. Well I can’t handle this type of stuff very well, especially when I am trying to cook and I am tired and just want to eat, haha! So out of pure anger I acted like a two-year-old and standing on the kitchen floor, jumped up and slammed my feet in to the ground…really hard. I didn’t feel it at first, but then when I tried to take a step my right leg totally gave out. I had never felt such pain in my heel before! I couldn’t walk at all. What the hell was I going to do!? Well all of last week I had to limp and hobble in immense pain. *try walking walking from the depth of the school parking to the entrance and then to nine classes all on practically opposite sides of a 3 story school for 5 days*. It was pure hell. I was basically in tears any time I had to walk and I was late to all my classes. (Good thing no one cares). I ended up going to the doctor on Thursday (for a totally unrelated reason which was another thing that made last week the worst. I have an extreme fear of doctors and want to die anytime they are even mentioned to me). But Anyway, the doctor said that I probably just bruised the heel bone and it would hurt a lot, but should get better with time. It has gotten a little better and usually loosens up once I am up on it a bit. But when I wake-up and take that first step form bed…o man… I could fall on the floor in pain. So I am still taking it every day, but hopefully in a few more days everything will be cheery, otherwise I will have to get an X-ray. But I have been able to keep up with my normal workout routine which kind of pisses me off! I can do squats lunges (calve raises hurt a bit and moving from certain positions), but really they only thing that just hurts like hell is walking! Go figure. But let us all try to keep things positive this week even though I have mid-terms starting tomorrow, I have today off for MLK Day, yay! So today’s Power Monday is a bit special. I was picked to be a guest host for the #LetsMingle Monday Social Media Link-Up! It is a bi-weekly blog hop where we all share our social media links and get to meet and find new bloggers! You can link up your Facebook, Google+, Pinterest & Twitter handles for new social media exposure. 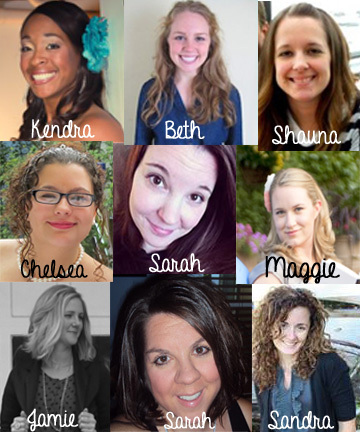 Here are the lovely ladies who make this blog hop possible every week! So lets get to it a be social! Just click the blue link froggie and then add you link by following the prompts! Then check out all the other lovely bloggers and social media(ers) and find some one new to follow! There are just a few suggested rules: 1. No Etsy shops or giveaways 2. Follow the co-hosts and featured guest. 3. Visit at least two other submissions and follow them. 4. It’s not required, but please add our button to your blog. Don’t forget to leave a comment below to let me know if this is your first time here and I will be sure to visit your blog and follow you back. So there you have it guys! And thank you to all the hosts for allowing me to be their guest! It is a nice way to ease back in to the week. But my weekend helped too. Saturday I allowed myself to get some extra sleep all morning, made my carrot cake waffles and subbed a tablespoon of flour for cornmeal and they came out so crispy! Then I went to the grocery and loaded up on produce and short grain brown rice! I haven’t had just plain brown rice in a very long time. I usually would get a rice mix, but for some reason I have just been craving goof old plain brown rice. It was divine in an sprouted lentil Asian bowl I made. I was going to actually try my hand at sushi again but I said screw it and let myself have a easy effortless dinner haha! And of course that night ended with a really good yoga practice that left me full of love and energy! O and did I mention, my mom got me a subscription to Yoga Journal for Christmas and forget to tell me! I was so excited to find it in the mail last week! 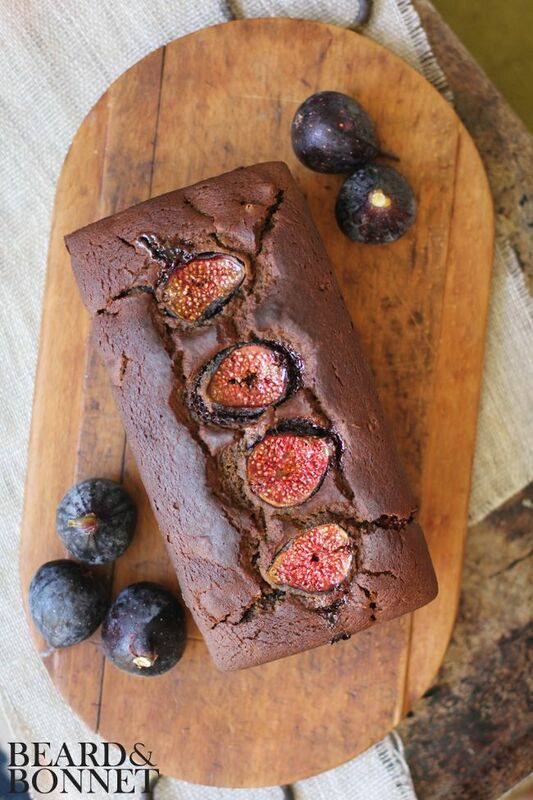 Sunday was the same, but a little more vigorous studying but also a really great new breakfast recipe ;). So I am off to enjoy my day off and then I have Group Power tonight. I will see you tomorrow! Hugs and love my friends! How was your weekend, do you have today off? What is your favorite type of rice? Well obviously right now it is brown, but I do love black rice and good old fancy (expensive) wild! Happy Friday! Wednesday and Thursday the temps were amazing here in Jersey. 80s all day, love the heat. But Thursday morning (and evening) there was a huge thunder storm, so my day started out pretty gloomy, dark, and depressing. I hate going to school when it is so dark and rainy out. It really makes that day that much longer ad harder to get through. And now Friday and the rest of the weekend the temps are supposed to be in the 60s….ugh! I can not stand the cold chilly weather. I am absolutely dreading the fall/winter! If you are experiencing crappy weather then hopefully the Friday Finisher will brighten your day! 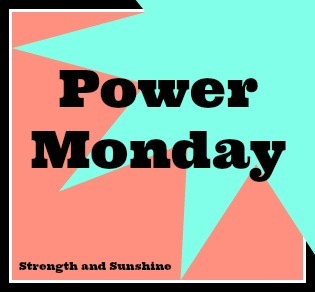 Monday: Power Monday #10 What is Beauty? Haha! This is hilarious and so true! I still don’t know how I feel about Crossfit. I guess I will have to try it someday, but right now I am kind of eh about it. Love this! Yoga is for everyone and it is not about perfection, but doing what you love. + Is a Calorie Just a Calorie? Simple…Fuel your body with REAL WHOLE FOODS! The perfect equation to being happy, healthy, and loving life! Great tips if you are just starting out on your new journey! It won’t be horrible, I promise! A little humor for those of us with allergies, intolerances, and disorders. Cozy Aztec Sweater. I want/need/love this! 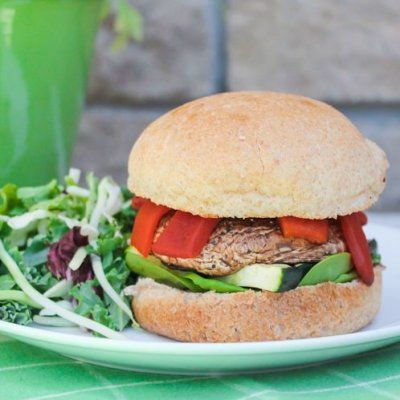 Easy Balsamic Portobello Burgers. Just another reason to have a mushroom obsession! A Pop of Color. Cute fall outfit with a touch of Summer. 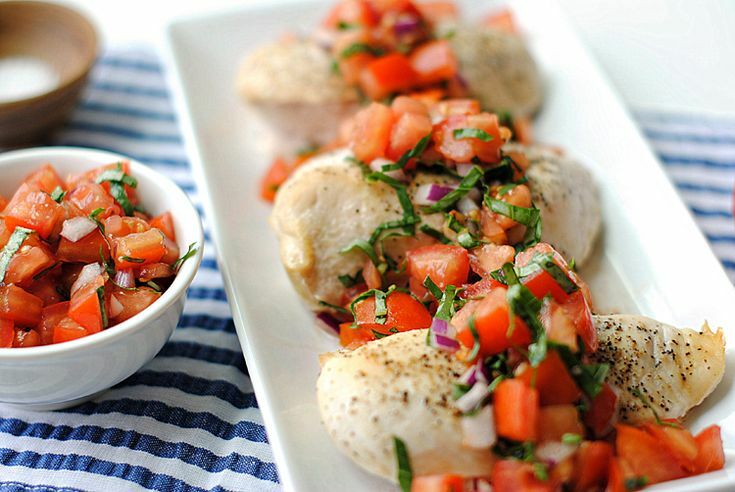 Bruschetta Chicken. Light easy chicken for dinner! Stair Landing Window Seat. Perfect little space to read a book and look out the window! 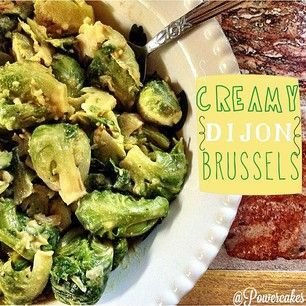 Creamy Dijon Brussels. So good! But I have to eat them in EXTREME moderation. Like 2 one day, skip a day and maybe 2 more, due to my ever loving stomach! 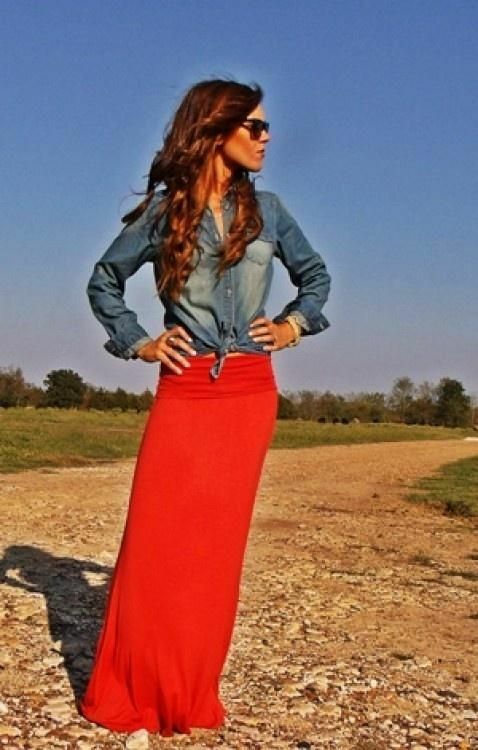 Maxi and Denim. Love this look! + I had a half-day on Wednesday in school! So very much needed. + 96 days (and going strong) of being (eyebrow and eyelash) trich free! + I was invited to participate in a fun blogger opportunity which I will tell you more about in October! Stay tuned! Do you do Crossfit? If not do you want to try it? Do you fall into one of those Social Media stereotypes? I don’t…at least I hope not! Any fun plans for the weekend? I will just be doing the same old. Homework, studying, volunteering, yoga, grocery shopping, and hopefully reading. I am still slacking with this ever since school started! O and I need to finish up a few more college apps…not fun.